Below you fill find all funeral homes and cemeteries in or near Davenport. Davenport is also known as: Scott County / Davenport city. Their current mayor is Mayor Bill Gluba. Zip codes in the city: 52801, 52802, 52803, 52804, 52805, 52806, 52807, 52808, 52809. The Runge Mortuary and Crematory was established in 1895 by Henry Runge. Since that time, five generations of the Runge family have led the way in mortuary and crematory services for the Davenport area. Some of the notable people born here have been: Lara Flynn Boyle (actor and model), Randy Shilts (journalist and author), Roger Craig (american football player and actor), Ed Conroy (basketball coach and coach), Linnea Quigley (film producer and actor), Matthew Ashford (actor and film producer), and Justin Diercks (race car driver). Davenport is the largest city located along the Mississippi River in Scott County, Iowa, United States. Davenport is the county seat of and largest city in Scott County; it is also the largest of the Quad Cities, a metropolitan area with a population estimate of 382,630 and a CSA population of 474,226, making it the 90th largest CSA in the nation. Davenport was founded on May 14, 1836 by Antoine LeClaire and was named for his friend, George Davenport, a colonel during the Black Hawk War stationed at nearby Fort Armstrong. According to the 2010 census, the city had a population of 99,685 (making it Iowa's third-largest city). However, the city is currently appealing this figure, arguing that the Census Bureau missed a section of residents that would place the total population over 100,000, and indeed, even the Census Bureau's own estimate for Davenport's 2011 population is 100,802.Located approximately half way between Chicago and Des Moines, Davenport is on the border of Iowa and Illinois. The city is prone to frequent flooding due to its location on the Mississippi River. There are two main universities: Saint Ambrose University and Palmer College of Chiropractic, which is where the first chiropractic adjustment took place. Several annual music festivals take place in Davenport, including the Mississippi Valley Blues Festival, The Mississippi Valley Fair, and the Bix Beiderbecke Memorial Jazz Festival. An internationally known 7-mile (11 km) foot race called the Bix 7 is run during the festival. The city has a Class A minor league baseball team, the Quad Cities River Bandits. Davenport has 27 parks and over 12 miles (19 km) of recreational paths for biking or walking.Four interstates and two major United States Highways serve the city. Davenport has seen steady population growth since its incorporation, with an exception being the 1980s, when the population decreased due to job loss. Davenport has a declining crime rate and a low rate of unemployment, and was ranked as the most affordable metropolitan area in 2010 by Forbes. In 2007, Davenport, along with neighboring Rock Island, won the City Livability Award in the small-city category from the U.S. Conference of Mayors. In 2012, Davenport as well as the Quad Cities Metropolitan Area was ranked among the fastest-growing areas in the nation in the growth of high-tech jobs. 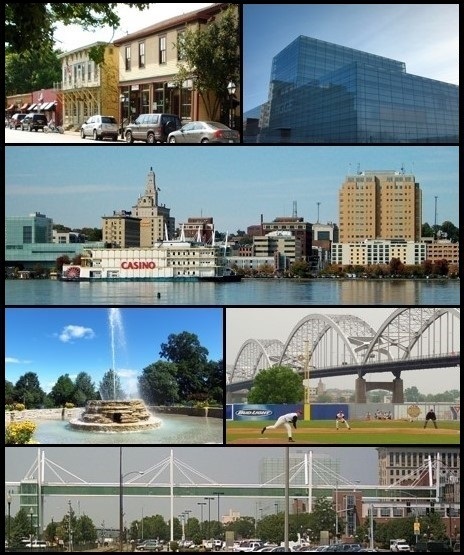 Notable natives of the city have included jazz legend Bix Beiderbecke, Pulitzer Prize-winning playwright Susan Glaspell, former National Football League running back Roger Craig, and current WWE World Heavyweight Championship holder Seth Rollins.The current mayor of Davenport is Bill Gluba. It was disclosed by San Diego Union-Tribune on March 30th, 2019 that Joseph Thomas Sr Duffy perished in San Diego, California. Duffy was 74 years old and was born in Davenport, IA. Send flowers to express your sympathy and honor Joseph Thomas Sr's life. It was noted by San Diego Union-Tribune on March 14th, 2019 that Jack Frederick J Mangelsdorf passed on in Encinitas, California. Mangelsdorf was 68 years old and was born in Davenport, IA. Send flowers to express your sorrow and honor Jack Frederick J's life. It was noted by Cincinnati Enquirer and Cincinnati Post on March 10th, 2019 that Delores Catherine "Tootie" Meinert (Mengel) perished in Washington Court House, Ohio. Ms. Meinert was 94 years old and was born in Davenport, IA. Send flowers to express your sympathy and honor Delores Catherine "Tootie"'s life. It was revealed by Des Moines Register on March 6th, 2019 that Kathleen Sister "Marie Celeste" Tomlonovic perished in Davenport, Iowa. Tomlonovic was 80 years old. Send flowers to express your sympathy and honor Kathleen Sister "Marie Celeste"'s life. It was noted by The Advocate on February 17th, 2019 that Beverly G Crockford (Gustafson) died in Newark, Ohio. Ms. Crockford was 88 years old and was born in Davenport, IA. Send flowers to share your condolences and honor Beverly G's life. It was revealed on February 10th, 2019 that Francie Louise Bowie (Goggins) passed on in Davenport, Iowa. Ms. Bowie was 69 years old. Send flowers to express your sorrow and honor Francie Louise's life. It was written on February 6th, 2019 that Mary Bolger (Lawrence) passed on in Avon, Ohio. Ms. Bolger was 82 years old and was born in Davenport, IA. Send flowers to express your sorrow and honor Mary's life. It was disclosed by The Daily Herald on January 13th, 2019 that Barbara Anne Brinkman (Black) died in Palatine, Illinois. Ms. Brinkman was 72 years old and was born in Davenport, IA. Send flowers to express your sympathy and honor Barbara Anne's life. It was disclosed by San Diego Union-Tribune on January 13th, 2019 that John D "Jack" Halston died in Oceanside, California. Halston was 78 years old and was born in Davenport, IA. Send flowers to share your condolences and honor John D "Jack"'s life. It was disclosed on January 6th, 2019 that Elsie M Schultz passed away in Davenport, Iowa. Schultz was 97 years old. Send flowers to share your condolences and honor Elsie M's life. When planning a funeral in Davenport iMortuary can be of assistance. Browse our site to locate up-to-date listings of the funeral providers available in Davenport. Search for funeral services below such as cemeteries, cremation providers, funeral flower arrangers, and funeral homes. Davenport was mainly founded by Antoine LeClaire. Antoine served as a translator between the Keokuks and the US army in an effort to create a treaty to end the Black Hawk War. The Keokuks gifted land to Antoine's wife who was related to a Sac chief. An agreement was made for Antoine to settle on the exact site where the treaty was signed, which became the location of Davenport. The official website for the city of Davenport is http://www.cityofdavenportiowa.com/. Listing all funeral homes in Davenport, Iowa so you can easily send flowers to any location (same day delivery) or find any funeral service. funerals in Davenport, IA 52801 on Yahoo! Local Get Ratings & Reviews on funerals with Photos, Maps, Driving Directions and more. Funerals in Davenport, IA on Yahoo! Local Get Ratings & Reviews on Funerals with Photos, Maps, Driving Directions and more. We work with local florists and flower shops to offer same day delivery. You will find budget sympathy flowers in Davenport here. Our funeral flowers are cheap in price but not in value.